These beautiful beetles originate from the Ivory Coast in Africa. 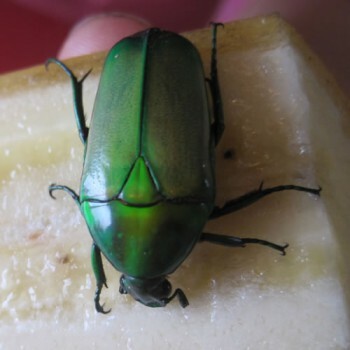 They have been used to produce jewelry (hence the name) as their iridescent green exoskeleton is stunning. In captivity they LOVE to eat banana and have a funny plastic smell to them! They start off life as eggs, then a grub which builds a cocoon around itself. Approximately eight weeks later this little gem emerges. They also have the ability to fly, well it's more of a case of aiming themselves at things than actual graceful flight. It works for them!